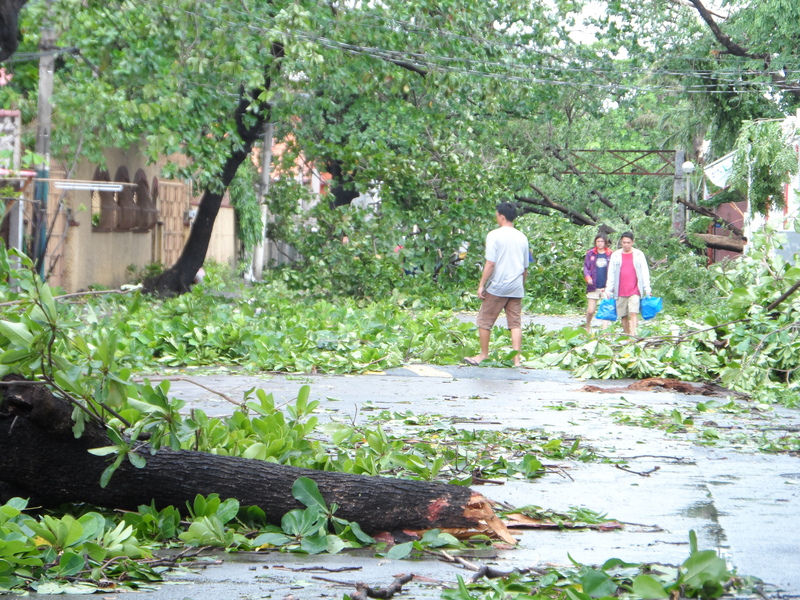 Typhoon Rammasun slammed through our country last week, leaving much of the Philippines’ capital region without electricity for several days. Power was restored in our place during the wee hours of this morning, ending six days of candlelit dinners. Rammasun was the first major storm that sliced though our country this year, and was by far the strongest since Super Typhoon Haiyan killed more than 7,300 people last November. Rammasun’s death toll continues to rise and is now more than 80. At least two Asian dailies have called our country “disaster weary.” South China Morning Post reported, “The disaster-weary Philippines braced for a second severe storm in five days yesterday as the death toll from Typhoon Rammasun surged to 77, officials said.” Typhoon Matmo followed in the heels of Rammasun, even as many of us were still wading through the debris left by the typhoon. Fortunately, it did not make landfall. “Mother nature battering nature,” was the only way I could describe the scene that I saw through my window a week ago, as Rammasun’s winds whipped everything on its path for three hours. Sometimes the beating abated, and I would say to myself, “the worst is over,” only to hear the wind howling again. I’ve lived in the Philippines all my life and have experienced many typhoons – an average of twenty typhoons pass through the country every year during the rainy season. Rammasun fortunately did not bring much rain, but it caused so much damage because it was such a slow-moving typhoon, lashing through several provinces at only 25 kph. The camera was a handy tool to record the devastation brought by the typhoon. But the journal and pen provided the best way to help myself deal with all that happened and all that was unfolding. The typhoon blew over yesterday, destroying so many properties, uprooting so many old trees. This is the strongest storm I’ve experienced in my life. It is also reflecting a storm happening within….. It was the perfect companion that helped me understand my grief at the loss of lives and so many, many wonderful trees that have graced the roads near our house. It also allowed me to immortalize moments that not even the best camera in the world could capture. Four days into “no electricity.” The nights are peaceful – I heard a lone cricket humming loudly as I checked on the animals last night. This morning, I was awakened by a single bird singing such a melodious song. I wonder now where all the birds were during the typhoon. And the journal provided the place where I could write about the blessings in the midst of the storm’s aftermath. So little I want to write here. Still no electricity – going on our 6th day. God is giving me a digital fast, and since I have not gone for work, I’m blessed with a vacation too! Yes indeed, I continued early morning writing through the past week, and wrote on my journal at night to help me weather the storm that had began to brew within me. It was heartbreaking to see that many trees that had greeted me along familiar roads through the years had been uprooted – their mammoth roots rising up in the air as though they were tree branches. We lost many lives, trees and properties. We will remember those who have gone, grieve their passing away and allow their memories to inspire us; we will plant seedlings that will grow into old trees through the years, and the trees will continue to spread their magic and imbue our surroundings with a special charm that far outweighs the commercialism that is taking over the suburbs; and we will rebuild our homes and roads and pick up where we left off, and continue to be the fun – loving people that we are. Reflecting on the challenges that living in an archipelago that is both in the Ring of Fire and the typhoon belt, I realized that it is the constant battering from mother nature that has made us learn how to live each moment as happily as we can. Feeling the strength of mother nature often, we have learned to find strength in helping each other – what we call the bayanihan spirit. When the winds abated and only a slight drizzle remained, my brother – who lives next door – went outside and I ran after him. On opening the gate, we saw a shallow river where the road was. Rainwater remained stagnant because the felled trees were all over the street. Soon, men came out of their houses with their bolos (machete) and they started hacking away at the felled trees so that vehicles could pass through. My brother and his son soon joined the impromptu corps that cleaned up the debris within the perimeters of our properties and outside as well. Within a few hours, the road was passable again. Such is life in our islands, such is life for the Filipinos. We brace for the storms and earthquakes and we weather them. We count our blessings amidst adversity and rely on our faith to guide us. Sometimes, when disasters come one after another, we do indeed become “disaster-weary.” But life goes on, and we continue to enjoy life. And as for me, I will keep on journaling through good and tough times. My heart goes out to you. Stay safe. My prayers are with everyone affected as healing begins . . . Thank you for sharing this with us. I had no idea of what happened. I don’t normally watch news. I send to you and your country my healing prayers. Please be careful and safe. Those Must be hundred year-old acacia trees. Sayang. Ay naku Elmer, sayang talaga. That’s not all of them, so many others I wasn’t able to photograph. Thanks for the visit. Thank you for visiting my blog, Rosanna! The news here in the states did not share half of what you’ve shared through your writing and photos. There are so many things going on in the world, and sadly, it seems to be escalating. Praying healing for you, your family, and friends! Thanks Deborah. I love visiting your blog, you make great digital art! thanks this is a great metaphori truly enyejod it. I am in a 12 step program and this really aplies to my recovery process, because if i make the smallest steps of prgress or changes in behavior It has a trickle effect on my fammily and my life and truly changes lives.